T-Max Manager Pro by Applied Digital Inc. The T-Max Manager/Pro Control Unit by ADI, Inc. Welcome to the ultimate in tanning equipment control and monitoring. 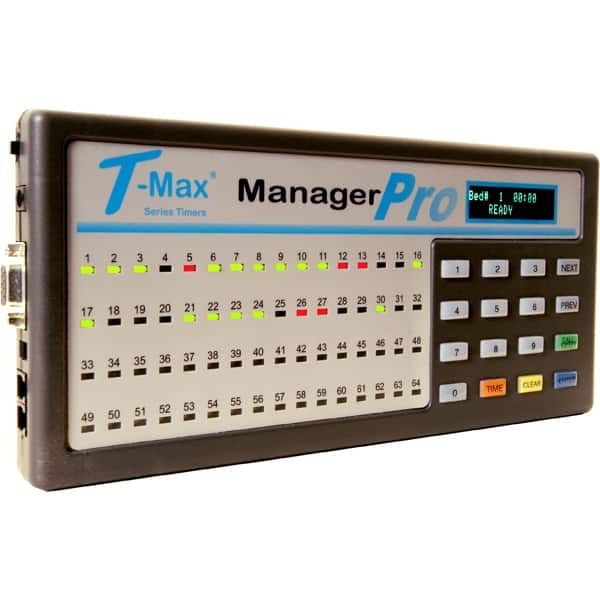 The Manager/Pro control system by T-Max is used as an all-in-one front desk operating system for tanning salons, gyms or other commercial tanning establishments. It can manage up to 128 individual tanning units via the T-Max 3W/G2 Timer and or T-Max 3A intercom timers or with any beds with pre-installed T-Max timers. The digital display has 64 dual colored lights showing the salon operator the status of all equipment being controlled by the system. A sixteen key keypad allows for manual operation when and if necessary and the Manager Pro can be controlled with a PC using today's most popular tanning software. A single salon can hook up as many as eight G2 controllers. For wireless options this control station works with the G2 Access Point system eliminating the need for wires and cables throughout the salon. Size - H5" x W10" x D2"
Size H5" x W10" x D2"